1. Line square pan with foil and grease it. Also grease the entire inside of the sauce pan, all the way up the sides. Grease the flat beater of the mixer too. 2. Combine everything in the sauce pan except vanilla. Heat on Medium, stirring constantly. 3. Once mixture boils, reduce heat to Med-Low and STOP STIRRING. Insert candy thermometer. 4. Once mixture reaches 238°F / 114°C, remove from heat and carefully place pot into cold water bath. DO NOT STIR. 5. Cool undisturbed for an hour, until temp falls to at least 120°F / 49°C. Once the mixture has cooled to this stage, there will be a skim on top, ignore it. Transfer to mixing bowl and pour in the vanilla. 6. 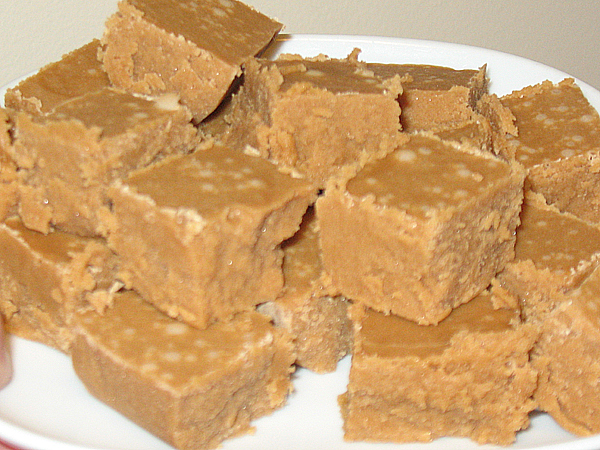 Beat until fudge loses gloss (refer to my HOW-TO GUIDE on fudge). If using a KitchenAid Artisan, beat 28 minutes on speed 2, stopping to scrape down bowl 4 times. 7. Pour into prepared pan and let sit at least 4 hours. 8. Lift out of pan and score the top with a knife, then slice into squares.